The Nikon Coolpix AW130 is a state of the art Nikon camera that debuted in 2015 and precedes the AW100, the AW110 and the AW120. The main difference between the newer AW130 model and the older versions is that it integrates a super ‘handy’ hand grip on the front plate of the camera. This does not seem like a huge alteration, but it always you to comfortably hold your camera. The Nikon AW130 costs around $400 to $450 and is available on a wide variety of different platforms, including Amazon and Walmart. The following in-depth review will assess this product’s value, specs, price, comparison to other similar products and more. We hope that this review of the Nikon Coolpix AW130 helps you determine if this specific product is the camera meant for you. The Nikon Coolpix AW130 is packed with the newest technology paired with Nikon’s well-versed camera engineering. 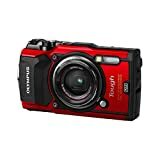 This versatile point and shoot fits in your pocket, takes amazing photos and is made to weather the storm and harsh conditions of the outdoors. The Nikon Coolpix AW130 is a 16-megapixel camera that is waterproof, shockproof and freezeproof camera with built-in WiFi and NFC capabilities. The camera boasts a simple and user-friendly point and shoot option with its Scene Auto Selector that works great even in low light. A huge plus of the Nikon Coolpix AW130 is the WiFi compatibility with your smartphone to automatically download and view your images. The Near Field Communication feature works for Android v 4.0 or later smart devices only. The Nikon Coolpix AW130 can also be controlled by remote control over WiFi using your smartphone or tablet. 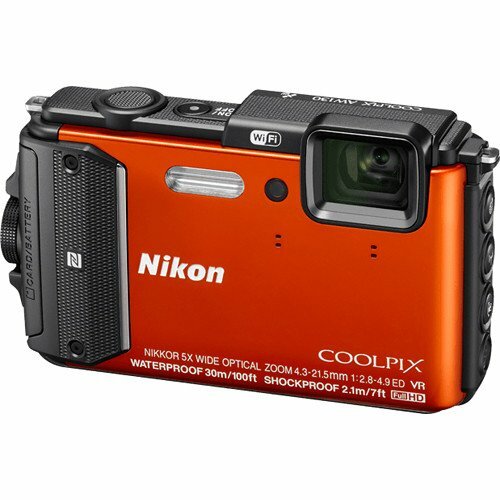 The Nikon Coolpix AW130 is a perfect pocket sized camera for those looking for a versatile but extraordinary camera. The Nikon Coolpix AW130 is a very user-friendly camera that could please both a keen camera enthusiast as well as a Nikon newbie. This specific Nikon model offers an easy Auto mode for those who love using the point and shoot, which is a very lovely option for those quick shots you just cannot miss. We love that the Nikon Coolpix AW130 has been outfitted with a three-inch, 921k-dot OLED display, an integrated GPS module and world map and a Nikon branded 24-120mm (eq.) f/2.8-4.9 lens. The AW 130 features a very similar looking design of its predecessors with its rounded but boxy design but offers the textured hand grip that makes this camera a completely different animal. The Nikon Coolpix AW130 lens which is located in the top-right corner when viewed from the front of the camera and it is shielded by a protective lens cover that is open when the power of the camera is turned on and off. The lens on the Nikon AW130 provides 5x zoom without having to extend. The focal lengths range from 24mm to 120mm in 35mm equivalency. For a fixed compact camera lens, the aperture-wise is actually shockingly quick and its brightness is f/2.8 at the wide end and f/4.9 at full telephoto. The lens on the AW130 integrates a lens-shift vibration reduction mechanism that allows the user to take sharp hand-held shots at shutter speeds that would seemingly be too slow for the focal speed that is typically used. The Nikon Coolpix AW130 allows the user to completely control their shots. Control the camera’s aperture and shutter speed to mutate your shot to produce exactly what you are looking for. The positive thing about the Coolpix AW130 though is, that you do not have to comprehend exposure controls to get the shot you are looking for, because the AW130 does this for you. The Coolpix AW130 offers a slimline flash unit for the camera’s stereo microphones and a shared self-timer/AF-assist/movie light lamp. The Coolpix AW130 features a large shutter release button on the top plate with a crosshatched texture to aid location, a round, recessed power button and a built-in GPS module. The GPS module in the AW 130 allows the ability to record the exact latitude and longitude and stores it in the data of each image so you will always know exactly where each image was taken. You can use the built-in offline world map to have your own electronic compass. The back of this wonderful camera offers a few cosmetic changes compared to the AW120 but it is still predominately the same. The OLED display is a 3-inch, 921,000-dot which gives the user outstanding viewing angles and a 5-step brightness adjustment. The camera offers a thumb-controlled zoom rocker, a movie record button, a multi sensor with ‘OK’ button in the middle and separate record/scene, playback, menu and delete buttons for convenient use. This ‘all-weather’ camera provides protection from freeze, water and shock. The WiFi capabilities of the Nikon AW series first made its debut in the AW120 and again in the AW130 allow its users to download their images to a smartphone or tablet without the use of cables or a memory card. You can also control the camera using a remote Wireless Mobile Utility phone application. This allows for easier access to taking and receiving your images. If we take the Nikon Coolpix AW130 and compare it to some other reputable cameras within a similar price range, we find that the Coolpix AW130 is an optimal choice when set against its competitors. Let us take a closer look, shall we? 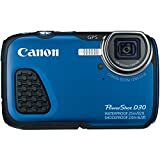 Let us look at the Canon PowerShot D30, Canon’s iconic waterproof pocket size camera that boasts a 12.1-megapixel with a 5x optical lens, lens control ring, focus peaking and 12 million pixels count camera. The PowerShot D30 offers a 3-inch screen with image stabilization and a total weight of 7.68 ounces. The video captures resolution that equals 1920 x 1080 (24p), 1280 x 720 (30p), 640 x 480 (30p) but has no viewfinder. Let us take the Olympus TG-5 Waterproof camera as another competitor’s example. The Olympus TG-5 offers a new 12MP hi-speed image sensor for improved low light performance and noise reduction. The dual quad core TruePic VIII image processor is used through a 3-inch 460k-DOT LCD monitor. This camera is said to be waterproof up to 50 feet, dustproof, shockproof from seven feet, freezeproof to 14 degrees, crushproof to 220 pounds and an anti-fog lens. 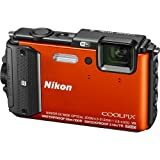 The Nikon Coolpix AW130 is a wonderful option if you are looking for a versatile and reasonably priced camera with all-weather capabilities. This camera offers a travel-ready camera with a NIKKOR glass lens optimal for outdoor and traveling in harsh conditions. This camera is a user-friendly shooter that takes just over a second to start up. In good light, it offers an impressively fast shooting speed and there is a stacked suite of continuous shooting modes that users love. Users also love the HDR shooting and post capture D-lighting features of the AW130. Cons of the Nikon Coolpix AW130 include the overall low image quality that tends to only be able to be printed on 18 x 24 cm size prints. The corners in photos look rather disappointing with blurry images and overenthusiastic noise reduction. The camera is also not known for being great at night shooting, so if you are aiming to shoot more during the day, this camera might be a great choice for you. After considering all the aspects of Nikon’s Coolpix AW130 camera, it is safe to say this camera is a huge bang for you buck. If you are looking for a quality camera with wonderful all-weather capabilities, GPS locating and WiFi capabilities, the Coolpix AW130 might be the choice for you. We give this camera an overall rating of 4.5 when considering its ease of use, features, design, image quality and value for your money. The camera offers a versatile all-weather design, a dedicated command dial, an incredibly accurate GPS tracking and NFC connectivity system and auto-mode. Both well-versed photographers, as well as complete camera newbies, can use this camera, which is why we love the Coolpix AW130 so much.